Good Morning everyone, last year the theme was “Manifestation of God.” I spoke to everyone and shared my testimony of my brother, of finding him after 63 years. Well he’s been here about two or three times since and in the month of August. 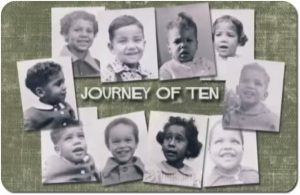 This past August and this is his family, I shared the video with everyone “The Journey of Ten.” This is my brother Robert, his wife Dorothy, this is my sister Evelyn, my sister Peggy, my brother Joe and his wife Margaret. And my family has just grown, I mean God has done amazing things in our life. Yesterday I emailed Pastor and he asked me if I wanted to share and this is the hardest thing for me. But I said I would and wanted to know if anyone wanted to say anything? Evelyn: Well when I talked to Sonja, after Bob had told us. Well actually what happened Peggy and I went to a conference in Austria where we met her half-sister. At the time though, I did not know that was her sister. So when we came back, Maria (her sister) sent me an email and said I think your brother is my brother. So I was like “Wow” okay, let’s go ahead and explore that. So then we skyped with Maria and we found Sonja. When I talked to Sonja, I said “Sonja, you know that you just got a whole big family, you didn’t just get Bob…you got all of us.” It has been such a blessing these past few days spending time and just getting to know each other and we’re just absolutely thrilled to be a part of all of this. My name is Bob and it’s been an experience, meeting my mom after 63 years. You know God is great! So great and we talked with Ricky (Sonja’s husband) last night. The things we take for granted God has planned for us already. I’m kind of shy, no, I tell you this is unreal having met my mom, having met my sister, and my other sister after 63 years of not knowing…well kind of knowing they’re out here but not knowing where they’re at or what. It’s been good, it’s been an experience. Ricky: And church you have to remember, these people were separated because of the color of their skin. They were taken from their family because at the time, it was unlawful to have mixed kids. So they were placed in orphanage, and the journey of ten. Well we have four of them here today, two have passed on and the others couldn’t get the time to be here, they work and have families. My wife’s prayer in August when I asked her what she truly wanted she said “I want my family to be reunited.” I said “well the Gate is open now is the time.” From that point on Bob, he lives in Idaho, right on the Oregon/Idaho border he came and visited. And we started talking to Evelyn and Peggy and Joe. These kids even though a society gave up on them, they didn’t give up on each other. They are all mighty men and women in what they do. They are truly blessed because no matter what, they still know that God is real! Amen! I thank God for all of this. I thank God, He is true to His Word because now my wife who all these years thought she was an only child has way more brothers and sisters.